I thought I would write about the beautiful gray fabrics that are in production now. Grays are very popular and come both in warm and cool tones. Scalamandre is a luscious fabric line with many colors and weaves of fabrics. I love this photo as it shows all the necessary textures needed to make a monochromatic room warm and sophisticated. In this case I refer to monochromatic as a single hue or one major color tone for the palette. The word “hue” refers to the selected color. By using this warm gray and adding slight accent color tones the gray is the focus. 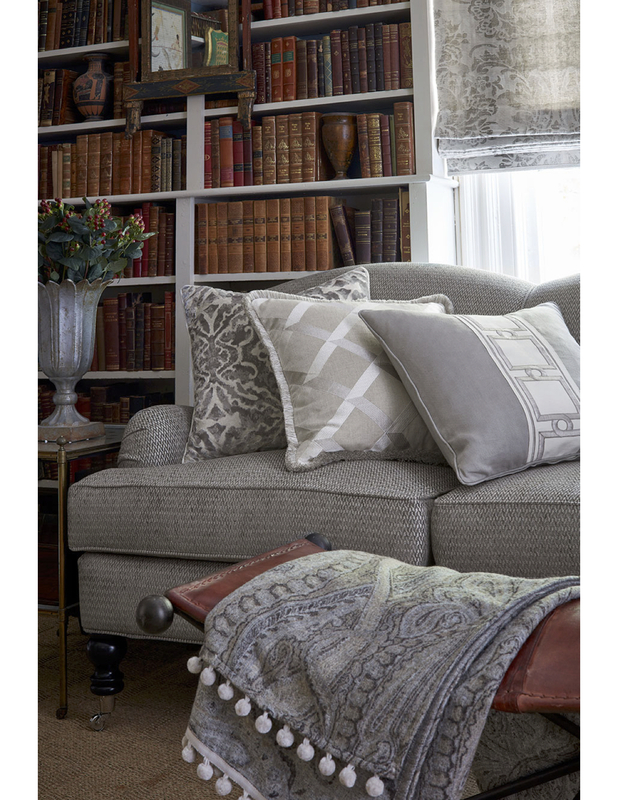 Just look at how beautifully the textures fill out the space: a sleek fabric with a glossy diamond pattern between two classic cottons with classic styles are nestled on the sofa as pillow accents. The sofa has a rich, thick tweedy texture with a classic style and turned dark wood legs with shiny chrome feet. The rich linen damask roman shade at the window offers extra pattern and texture. The throw on the ottoman has a cashmere look to it with a paisley layer of multiple grays and a slight blue for soft accent colors. The pom pom trim adds a bit of whimsy. The ottoman itself adds another type of fabric in that it is leather. The sisal rug brings out the soft warm golden tones in the throw. Take some time to examine all of the details in the photo and the layering of fabrics and textures. Then the next time you want to do a similar one hue color scheme you’ll know how to go about it!